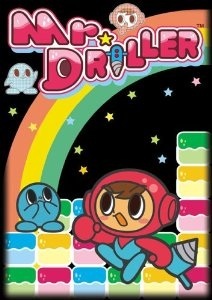 Mr. Driller is a series of video games developed by Namco. Mr. Driller puts the player in the role of a driller moving down through screens of blocks, having to keep his air supply from running out while avoiding being squashed by falling blocks. Games in this series have been released for PlayStation, Dreamcast, WonderSwan, Game Boy Color, Game Boy Advance, Nintendo GameCube, DS, WiiWare, Xbox Live, Windows, and iOS in addition to the arcade versions. The main character of these games is Susumu Hori, the son of Taizou Hori, who was the star of the original Dig Dug game. The project that would become Mr. Driller was originally intended to be a third game in the Dig Dug series, under the working title of Dig Dug 3. Hexagonal blocks were briefly considered, but this idea was abandoned when chain construction proved to be too complicated. Dig Dug 3 was initially developed unofficially by a few Namco staff; however, work on the game was suspended while R4: Ridge Racer Type 4 was being completed. However, Namco executives were impressed with the game and decided to support it as an official project. In Mr. Driller, after a character is selected and a country is selected, the player then drills a seemingly endless onslaught of colored blocks, ending with that country's given mileage (given in meters). The blocks can merge with other similarly colored blocks, therefore disppearing after 4 or more blocks merge. There are 4 main colors of blocks: red, blue, green, and yellow. There are also 3 special kinds of blocks: white blocks, which are pale blocks that don't merge with other similarly colored ones; crystal blocks, blocks that last for around a few seconds before disappearing; and X-blocks, brown crate-like boxes that take 5 drill hits to disintegrate, and also take off 20% of the player's air supply. The player has an air supply that acts as his/her vitality gauge, and when it is under 30%, the player's complexion will turn blue and a bubble with an air capsule will appear over his/her head. To keep the air from running out, the player can collect air capsules that replenish the driller's health by 20%. A life is lost when the player's air runs out, or if he/she is squished by falling blocks. The gameplay has been described as "Dig Dug meets Tetris."